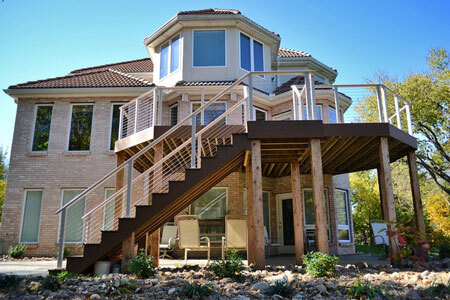 An Aluminum Cable Railing System opens the deck and stairs of this traditional home to a spacious, woodsy backyard. The clay powder-coat matches the creamy exterior and highlights in the brick siding, while the shaped top rail mimics the softened edges of the house’s octagonal towers and smooth tile roofing. Reinforced aluminum system withstands the tension of cable infill without bending. Clay powder-coat offers a soft, neutral accent for rich and warmly-colored surroundings while protecting the aluminum from the elements. Shaped Aluminum Top Rail matches our posts and provides a uniquely rounded and lower-profile alternative to rectangular. Deck mount posts are easy to install. Field assemblies have a low-profile look with no bulky turnbuckle. Angled Stair Washers allow the field assemblies to properly handle the stair sections of this railing.